We are eminent manufacturers and exporters of precision-engineered PVC Coated Copper Tubes & Copper Coils. Our product features immaculate designs for protection against aggressive environment and unique colour coding to facilitate in identification. The copper tubes offered by us are provided with optimum PVC sheath that make these ideal to be used in harsh operating conditions. We have available with us a precision-engineered range of Brass Compression Fittings. These are available in various types such as, single ferrule and double ferrule fittings and are offered in various metals such a stainless steel and aluminum. Being pioneers of the industry, we are involved in offering a quality approved array of Copper Pipe PVC Coating. The Copper Pipe PVC Coating we offer is widely demanded amongst the clients for its availability in various sizes and specifications. These products are known for their safe use. 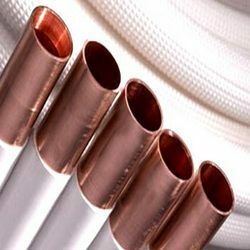 We are one of the leading suppliers of PVC Coated Copper Tubes & Pipes in straight & coil form that are manufactured using finest grades of raw material. We offer our range of PVC coated copper tubes in various length options in varied sizes. We can also customize our range as per the specifications provided by our clients. Finishing: 80, 120, 240, 320, 400, 600 grit and mirror polished. With the help of our team of professionals, we have been able to offer a world-class range of PVC Coated Copper Tubes in accordance with the specifications of our clients. The use of advanced technology and quality materials ensure for dimensional accuracy, longer working life and trouble-free operations. We are engaged in offering high quality PVC Coated Copper Tubes. 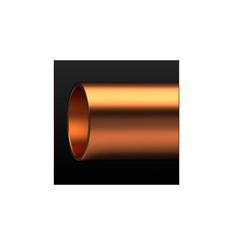 We offer our range of copper tubes in various length options and in varied sizes. These tubes are procured from reliable manufacturers of the industry. Moreover, we offer these tubes at market leading prices. Pvc Lex Coated G.i.Pipes are 100 % Water Proof, Rust & Corrision Free, Life Long Guarantee, No Colours To Apply, Available in 20 & 10 Feets Long, in White / Black / Blue.